LAWRENCEVILLE, Ga. - The Gwinnett Stripers, in conjunction with the Atlanta Braves, have announced their Opening Day roster for the 2018 season. Second-year manager Damon Berryhill will lead a Gwinnett club that includes three members of MLB.com's Top 100 Prospects list, each just 20 years old: Outfielder Ronald Acuna Jr. (No. 2), right-hander Mike Soroka (No. 31) and left-hander Kolby Allard (No. 58). The Stripers are led by Berryhill, pitching coach Reid Cornelius (second season), hitting coach John Moses (fourth season), coach Jose Mota (third full season), certified athletic trainer Nick Jensen (first season) and strength and conditioning coach Jason Curry (fifth season). Acuna Jr. is also rated the No. 1 prospect in baseball by Baseball America after earning that publication's Minor League Player of the Year award for 2017. Last season, the La Guaira, Venezuela native combined to bat .325 with 21 home runs, 82 RBIs, 44 stolen bases and a Minor League Baseball-high 181 hits in 139 games between Advanced-A Florida, Double-A Mississippi and Triple-A Gwinnett. After earning the Most Valuable Player Award in the Arizona Fall League last November, he had an impressive Spring Training as a Braves' non-roster invitee, batting .432 with four homers, 11 RBIs and four stolen bases in 16 games. Soroka, rated Atlanta's No. 3 prospect by MLB.com, earned the Braves' Phil Niekro Award for Minor League Pitcher of the Year in 2017 after going 11-8 with a 2.75 ERA in 26 starts for Mississippi. He made three appearances as a Braves' non-roster invitee this spring, posting a 1.80 ERA and a .125 BAA. Soroka was selected by Atlanta in the first round (28th overall) of the 2015 June draft out of Bishop Carroll High School in Calgary, Alberta, Canada. Allard, rated Atlanta's No. 6 prospect by MLB.com, went 8-11 with a 3.18 ERA in 27 starts for Mississippi last season, earning selection to the Southern League Postseason All-Star team. As a Braves' non-roster invitee this spring, he pitched 3.0 scoreless, hitless innings over two appearances. Allard was selected by Atlanta in the first round (14th overall) of the 2015 June draft out of San Clemente High School in California. Not included on MLB.com's Top 100 Prospects list but ranked No. 16 in the Atlanta system, outfielder Dustin Peterson returns to Gwinnett after an injury-shortened Triple-A debut in 2017. After batting .248 with one homer and 30 RBIs in 87 games last season, he hit .259 with two homers and six RBIs in 17 games as a Braves' non-roster invitee this spring. 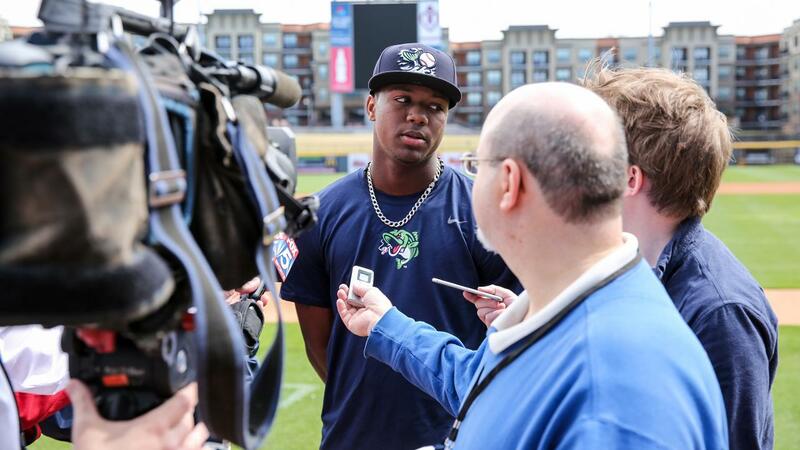 Acuna and Peterson headline a group of 15 players on Gwinnett's Opening Day roster who spent time with the club last year. Returning position players include two winners of Gwinnett Team Awards in 2017: Co-Most Valuable Player Sean Kazmar Jr. (.284, 11 HR, 45 RBIs in 99 games) and Most Competitive Player Rio Ruiz (.247, 16 HR, 56 RBIs in 103 games). Fan Favorite Player Xavier Avery (.259, 14 HR, 52 RBIs, 21 SB in 121 games) opens on the disabled list. Infielder Carlos Franco (.232, 10 HR, 39 RBIs in 93 games), outfielder Danny Santana (.500, 4 RBIs in 5 games) and catcher Kade Scivicque (.272, 2 HR, 11 RBIs in 24 games) round out the rest of the returning position players. Lawrenceville native Lucas Sims , named Gwinnett's 2017 Pitcher of the Year by Atlanta after going 7-4 with a 3.75 ERA in 20 games, returns to the pitching staff along with Aaron Blair (7-9, 5.02 ERA in 25 starts), Rex Brothers (0-0, 2.57 ERA, 1 save in 7 games), David Peterson (2-4, 4.12 ERA, 7 saves in 50 games), Phil Pfeifer (0-2, 3.60 ERA, 1 save in 11 games), Evan Phillips (2-3, 4.75 ERA, 2 saves in 25 games), Andres Santiago (2-0, 0.00 ERA in 4 games) and Matt Wisler (7-5, 3.56 ERA in 18 games, 14 starts). Soroka and Allard are the only two members of the Opening Day roster poised to make their Triple-A debuts, but they are two of nine players who will make their Gwinnett debuts in 2018. Other newcomers include pitchers Jesse Biddle (2-4, 2.90 ERA in 27 games with Mississippi in 2017) and Miguel Socolovich (2-1, 4.16 ERA, 1 save in 30 games with Triple-A Memphis in 2017), catcher Rob Brantly (.293, 10 HR, 46 RBIs in 83 games between Triple-A Louisville and Triple-A Charlotte in 2017), infielders Christian Colón (.302, 1 HR, 13 RBIs in 49 games with Triple-A New Orleans in 2017) and Tyler Smith (.239, 6 HR, 28 RBIs in 84 games with Triple-A Tacoma), and outfielders Ezequiel Carrera (.282, 8 HR, 20 RBIs, 10 SB in 131 games with Toronto in 2017) and Jaff Decker (.274, 6 HR, 36 RBIs, 15 SB in 93 games with Triple-A Nashville in 2017). Gwinnett's Opening Day roster features 12 players who saw time with a Major League team in 2017: Blair, Brothers, Ruiz, Santana, Sims and Wisler with Atlanta, and Brantly (Chicago White Sox), Carrera (Toronto), Colón (Kansas City and Miami), Decker (Oakland), Smith (Seattle) and Socolovich (St. Louis) with other clubs. The Gwinnett Stripers open the 2018 season with a road game on Friday, April 6 at 7:05 p.m. vs. the Norfolk Tides. Soroka will make his Triple-A debut as the Stripers' Opening Day starter. Tony Schiavone has the play-by-play call on 97.7 FM The Other Side of the River beginning at 6:35 p.m. The Stripers' home opener at Coolray Field is set for Thursday, April 12 at 7:05 p.m. vs. the Rochester Red Wings. For tickets, call 678-277-0340 or visit GoStripers.com/tickets.